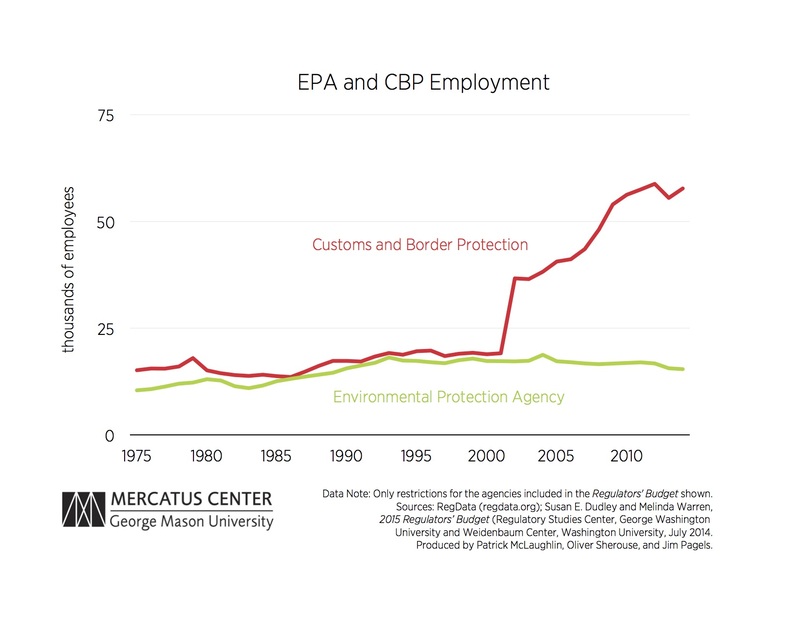 We previously analyzed the relation between regulatory agency employees and restrictions and found two major outliers, one by each metric: Customs and Border Protection (CBP) for employment and the Environmental Protection Agency (EPA) for restrictions. These are shown in the chart below. While EPA employment has decreased by 17.7 percent in the last 10 years, the agency has increased its restriction total by 28.5 percent during that time. Meanwhile, at the other end of the spectrum, CBP, a law enforcement agency of the Department of Homeland Security, has increased its employment by 51.1 percent while decreasing its restrictions by 6.2 percent. 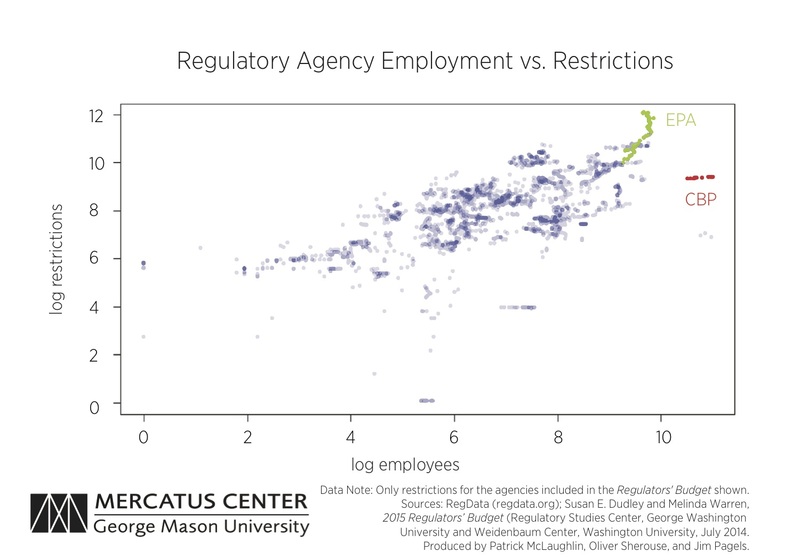 The two charts above show the number of restrictions and employees, respectively, for each agency over time. 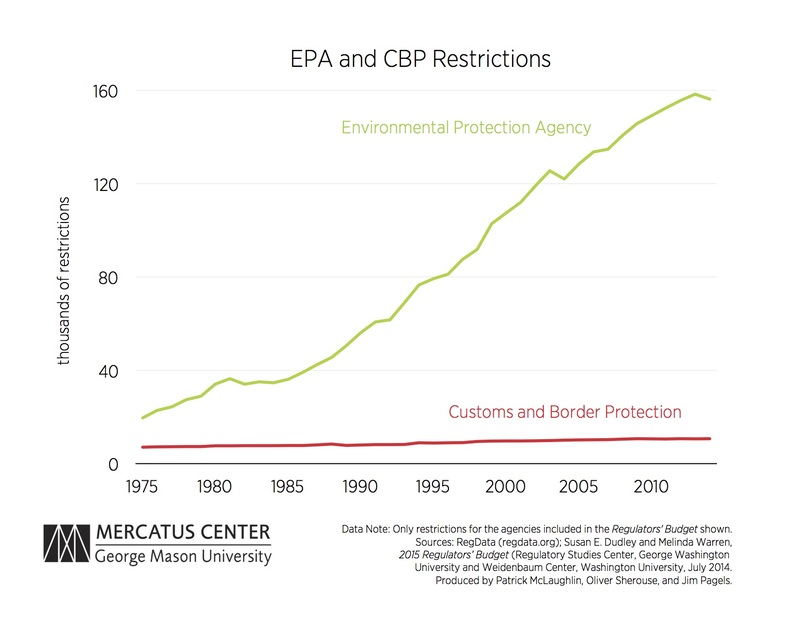 EPA restrictions (seen in green) have increased at a steady rate, while CBP restrictions (seen in red) have remained essentially flat from initial levels. In the third chart, however, we see a dramatic shift; from 2001 to 2002, employment at CBP nearly doubled from 19,128 employees to 36,664. This increase was a response to the September 11 terrorist attacks, but the jump was not a onetime increase; instead, employment at the agency steadily increased until 2012, when it began to level off. While the relation between the log of agency employees and restrictions is strong (0.639 correlation, where 1.000 would be a perfect match), there are certainly agencies that buck this trend.